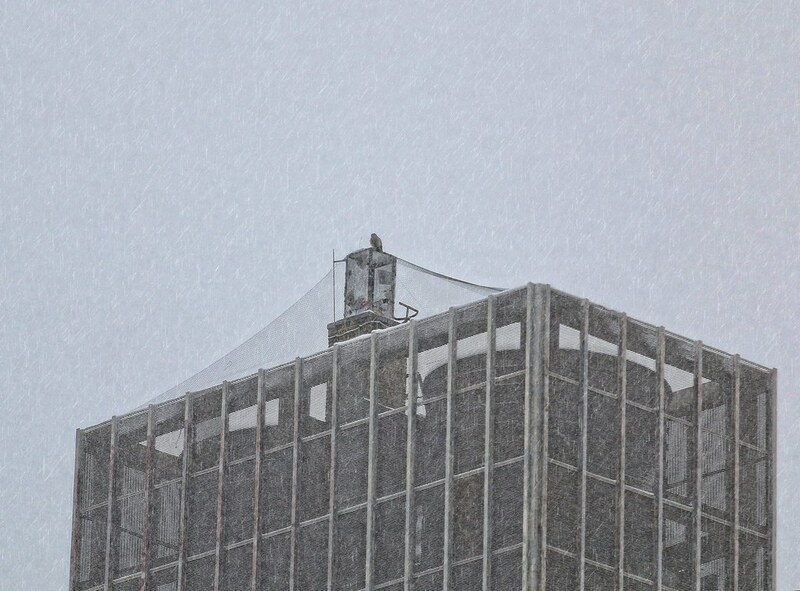 While slogging home from work during the snowstorm today, I spotted one of our hawks atop Village View on First Avenue at 3rd Street. I can't tell which one it is, but it sat up there quite a while, gazing west. I wanted to see if it would fly off and show me where it could be building a nest, but it looked to be firmly perched for the duration of the storm. A short while later, I came upon the other one on a fire escape on Avenue A at 6th Street. I'm not certain, but it looks like Christo. It would make sense that it's him as he likes to hang out on the fire escapes in this area, but both he and Dora have been spotted here several times recently. I didn't see any evidence of nest material and think he was just here riding out the storm. 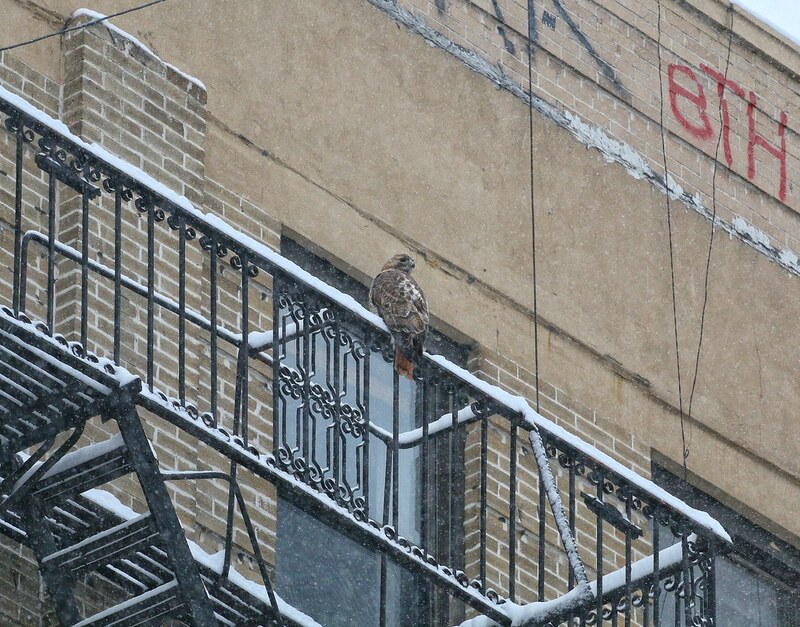 A week ago I was surprised by a hawk's visit: He landed on the banister of my fire escape at the north end of Eldridge Street. When he spread his impressive wings and flew off, he headed south. So, maybe he is one of the birds living at Seward Park rather than Tompkins Square Park. We've spotted nest-building material on Ageloff in earnest now and this morning they are both working on the nest. It's on the top floor of Ageloff, facing Ave. A, 2 a/c units in from the downtown side (they also have stored some sticks on the unit to the right of it). The one that says Friedrich on it. Will send photos in a bit. Excellent work - thank you!!! I was standing right on the corner of Ave A & 3rd St yesterday when I took the Village View photo. I must have stood there 20 minutes looking at this building. The a/c units seem too small and slippery on top to me, so I hope these guys know what they're doing. Anyone know who lives here? BTW - the hawk pictured is Christo. You can see the distinct brown stripes on his legs. Dora doesn't have the stripes. Looks like him! Thank you! I just wish I could have captured an image like that with my camera as well.